Two policemen who allegedly mounted an unauthorised police checkpoint and extorted money from drivers have been arrested. Although both of them are constables, one of them was seen in a police uniform which depicted him as an Inspector. 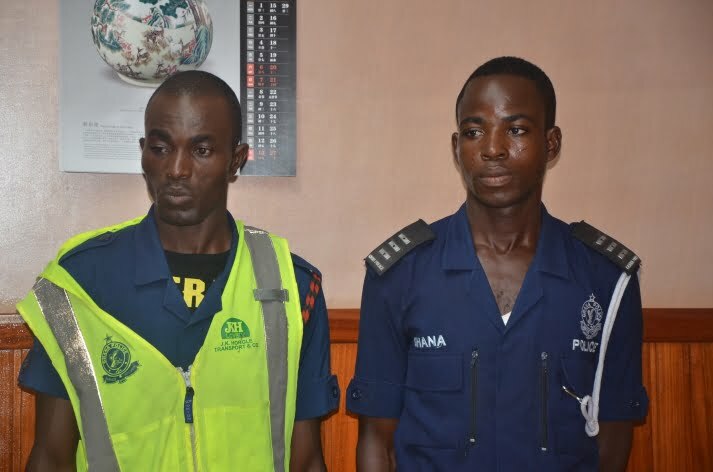 Personnel of the Police Intelligence and Professional Standards (PIPS) Bureau arrested Constables Faati Jacob Tinob and Musah Azumah at Tabora Junction, near Lapaz in Accra, about 8 p.m. last Thursday. The PIPS personnel had been deployed on a monitoring and inspection duty and were checking on police personnel at some selected snap checkpoints in Accra. Briefing the Daily Graphic, the Director of Public Affairs of the Ghana Police Service, Superintendent of Police Mr Cephas Arthur, said the PIPS team became suspicious when Tinob and Azumah started withdrawing from the checkpoint on seeing the police vehicle. He said Tinob was apprehended when he attempted to escape, while Azumah jumped on a motorbike which was parked close to the checkpoint and sped off. The PIPS team, he said, managed to lure Azumah back to the checkpoint and he too was arrested. A search on them revealed GH¢155 on Tinob, while Azumah had GH¢832 and two walkie talkies on him. Preliminary investigations, Mr Arthur said, had established that Azumah, a Constable with service number 78572, had been posted to Akyem Apirade in the Eastern Region last year. He was, however, said to have reported for duty and asked permission from the unit commander there to return to Accra to take a few of his belongings and also put his home in order. Azumah is said to have refused to return to his new post, in spite of attempts to get him to do so. His accomplice, Tinob, also a constable with the service number 48838, was attached to the Visibility Unit of the Patrol Department in Accra. When they were later paraded before the Inspector General of Police (IGP), Mr John Kudalor, the two men failed to explain their actions. The IGP then ordered for a search to be conducted in their homes. In Azumah’s house, the search party found one riot control armoured vest, four bullet-proof vests, two drivers’ licences, one police camouflage with an Inspector lanyard, a pair of military trousers, two military caps, two camouflage bags, one military shorts, among other items. However, no incriminating item was found in Tinob’s room when it was searched. The two have since been detained at the Nima Police Station. Mr Arthur said the Police Administration was doing everything possible to flush out people with dubious characters in the service in order to ensure effective service delivery and public protection. He, therefore, urged the public to assist in the exercise by reporting suspicious characters to the police.